Egypt’s largest opposition bloc on Saturday reached out to former members of the deposed president’s party, ahead of mass protests on June 30 demanding the ouster of his successor. The opposition’s move came a day after some 100,000 supporters of current President Mohammed Mursi, an Islamist and the country's first elected leader, packed a main square in Cairo to support him and challenge the largely liberal opposition that demands he step down. Mursi won a four-year term as president with some 52 percent of the vote in a run-off last June against Ahmed Shafiq, the last prime minister of now-ousted Hosni Mubarak. Shafiq is now contesting the election results. 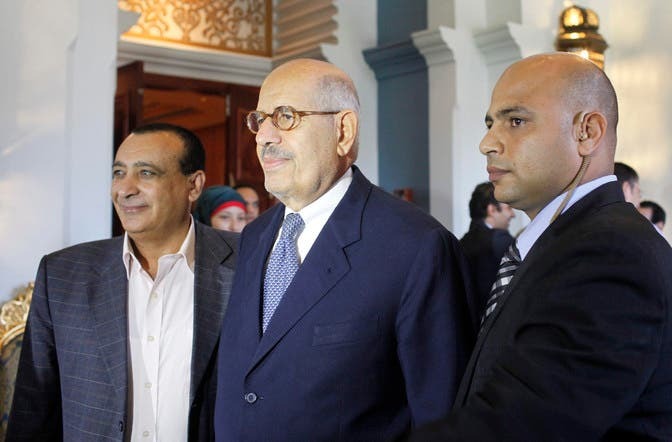 “I can’t isolate millions of Egyptian people because they were part of the National Democratic Party,” said Mohamed ElBaradei, a top leader of the opposition National Salvation Front, referring to Mubarak’s now-dissolved party. He said the invitation to Mubarak supporters did not extend to those who had been convicted of crimes under the old regime. “The masses of Egyptian people are calling for change,” he said, adding that the plan now was to discuss national reconciliation. He made his remarks during a two-day conference entitled “After Departure,” which aims to draw up a road map in case Mursi resigns as the opposition demands. Hamdeen Sabahi, leader of the leftist Popular Current opposition group, said a six-month transitional period would start the day Mursi steps down, during which a new constitution would be drafted and a new president elected. Others proposed that the head of the Supreme Constitutional Court should become the country’s transitional leader until new elections. Since the 2011 uprising that forced Mubarak from power, members of his NDP have been labeled “feloul,” or “remnants,” by both liberals and Mursi’s Muslim Brotherhood group. Joining ranks with the “feloul” is seen as a major shift and painful choice by the opposition, the vast majority of whom voted for Mursi last year in order to block Shafiq from taking office because they did not want a Mubarak-man ruling after the uprising. But the move is not too far-fetched, given that the Salvation Front was originally founded as an umbrella group for Brotherhood opponents, including figures like Amr Moussa who served as Mubarak’s foreign minister for 10 years before joining the uprising. The position could cause friction with other revolutionary groups however. After Mubarak’s fall, the NDP was dissolved and scores of top party officials were detained while on trial over various charges of corruption, along with former regime officials. The country’s Supreme Administrative Court in 2011 ruled that party members can participate in elections. The party has an estimated three million members. After it was disbanded, some joined newly established parties. A yet-untested “political isolation” clause in the new constitution may ban senior officials in the now-defunct party from top posts. The June 30 call is rooted in a months-long petition drive called “Tamarod,” or “Rebel,” in Arabic, which helped galvanize an opposition that has been demoralized and in disarray. Organizers announced on Thursday that they have collected 15 million signatures supporting Mursi’s ouster and early presidential elections. The opposition accuses Mursi of monopolizing power and of failing to deliver on promises to create an inclusive system where the opposition is represented. Mursi and the Brotherhood accuse the opposition of being used by Mubarak-men aiming to topple Egypt’s first democracy and bring back the old regime. Egypt’s Prime minister Hesham Kandil said that if the opposition had the support of millions of Egyptians, it should contest parliamentary elections instead of calling for the president’s overthrow. He also expressed worries of violence, saying, “Egyptian blood is very dear and what worries me most is that the revolution deviates from its peaceful path,” he said. Meanwhile, the country’s powerful military, widely suspected to be at odds with the president, said it will not intervene in political infighting. Ruling for nearly 18 months after Mubarak’s ouster, the military came under sharp criticism by liberals and rights groups for what they called mismanagement of the country’s transition, human rights violations and enabling an Islamists takeover. In the year since Mursi took office, the military top brass have expressed unwillingness to return to power. Police, who have engaged in deadly clashes with street protesters over the past two years, have signaled they want to stay out of any violence it is feared may erupt on June 30. Also on Saturday, MENA reported that the Presidential Election Commission sat Tuesday to look into Shafiq’s complaints alleging irregularities and forgery in last year’s vote. Shafiq is in self-exile in United Arab Emirates as he is being tried in absentia on corruption-related charges, which he says are politicized.